At the risk of being hyperbolic, I’d wager that about half of the experience of listening to pop music is really the experience of associations. Every time you hit play on a song you are greeted with a rush of memories, connections and extrapolations. You don’t just hear the music, but where you were the first time you listened to the song and who showed it to you. You hear the time of day and the season of when the song first truly made an impact on you. You hear an approximation of what you imagine the artist’s fans to be like, along with the various narratives spun by critics, interviews and publicists. And if you’re synesthetically inclined, you might even hear some of the album art bleeding into the natural colors of the music. When all of these things line up the effect can be staggering. It's what makes you reserve certain songs for specific playlists, or why you wait to break out an album until the leaves start changing color. It's powerful stuff, but it often exists outside of the control or intention of the artist making the music. Generally speaking, musicians can’t choose when their audience hears their record music, or under what circumstances. 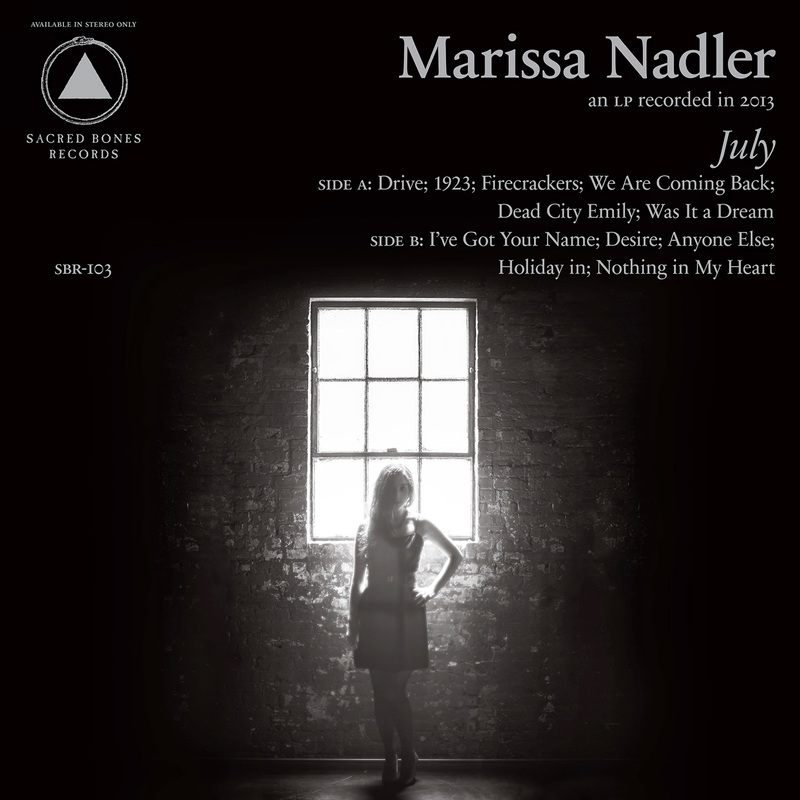 Usually this disconnect is fairly benign, but every once and a while you get an album like Marissa Nadler’s July that seems to be almost deliberately opposed to the associations its listeners will be inclined to make. July, Nadler’s sixth full length since her debut a decade ago, is an album concerned with the summer released in the middle of winter. Its also a subdued singer-songwriter record engineered by Randall Dunn, the producer for Wolves In The Throne Room and Sunn O))), with additional synthesizers from Steve Moore of the Prog Rock duo Zombi. Before a single note, all of that information will invariably color most listeners expectations. To be sure, nothing about July screams “summer”; in fact its mournful harmonies and languid pace make the record an easy fit to a grey morning or a 5pm sunset. This is anything but an accident though. By painting the summer in the shades of winter, Nadler reveals how a dissolving relationship can pollute everything around it by association. Through out Nadler’s voice is bolstered by ethereal harmonies, perhaps the only recognizable touch of producer Randall Dunn. Here again, associations end up giving the wrong impression. Seeing Dunn’s name attached to July and you’d be forgiven for thinking that Nadler has gone over to the dark side in an effort to be the next Chelsea Wolfe, but it's likely that she merely went with Dunn because he’s great at his job. The combination of Nadler’s voice and the crisply recorded acoustic guitar is captivating enough to carry the record, but Dunn wisely employs small embellishments to make key moments pop. Slide guitar floats in and out through the pauses in Nadler’s lyrics, and strings hover in the distance behind a great deal of the choruses. Steve Moore’s keys are most notable in their absence. Instead of the wall of analog synthesizers that Moore is known for employing, most of his contributions here come down to a simple organ in the background, or a low drone to boost the mood of a chorus. When he does become more present, like on “Dead City Emily,” he’s integrated remarkably well into the otherwise naturalistic and folksy instrumentation. By dint of its timing and contributors, July is likely to go down as Marissa Nadler’s “dark” album. And while it’s certainly not upbeat, it isn’t all that far off from her previous work. The album isn’t a departure so much as a magnification of Nadler’s latent forlorn qualities. The result is a record imbued with intimacy and warmth for the winter, and a haunting collection of songs to give you chills in the summer.